The Seoul Metropolitan Office of Education on Wednesday decided to extend autonomous rights given to five premium high schools for another five years, despite talks of removing the elite schools in the long run. 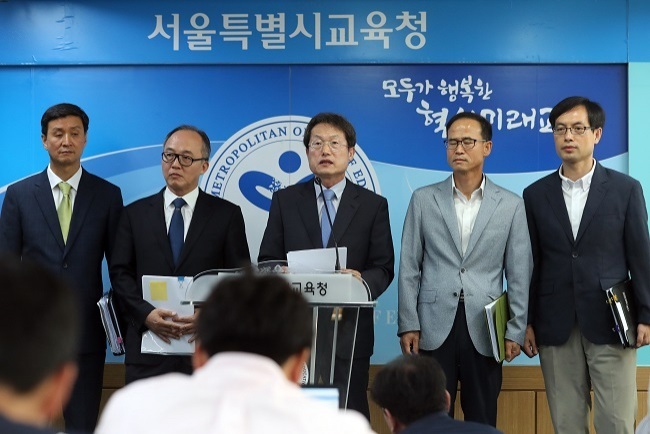 “All of the five schools subject to a re-evaluation will retain their status, as they received scores higher than the minimum level required,” Seoul’s Education Superintendent Cho Hee-yeon said at a press conference. Cho, however, made clear that the decision does not mean a change of stance regarding the future of elite schools, which fuel excessive competition here by serving as gateways to prestigious universities at home and abroad. He stressed the schools’ status extension was based on existing rules, which he said should be observed until they are revised. “We still believe the current system has departed from its initial purpose of creating diversity and autonomy in education,” Cho added, urging the government to revise rules to promote equality in education. Seoul is home to nearly 40 percent of the nation’s 77 elite private schools, which hold the status of either special-purpose or autonomous high schools. The five schools that were reassessed had received poor grades in an evaluation in 2015, becoming subject to re-examination this year. Seoul’s decision was closely watched by the provinces where reassessment of the elite schools is also pending. Since liberal President Moon Jae-in -- a critic of elitism in education -- took office, liberal education chiefs in Seoul, Gyeonggi Province and other areas have been voicing their intention to rescind the autonomy of such premium schools in curriculum and admissions.